The estimated lightning intensity is 21 bits, i.e. 0 ~ 16777201. This value is just a pure number and has no physical meaning, but it can be used to compare the relative strength between different lightnings. Connect the module to the Arduino according to the connection diagram. The I2C address defaults to 0x03, which corresponds to “AS3935_ADD3” in the code. If you need to modify the I2C address, you can change it to 0x01 or 0x02 through the DIP switch on the module, and modify the macro definition of the I2C address in the software "#define AS3935_I2C_ADDR AS3935_ADDx", where x can be 1, 2, 3. 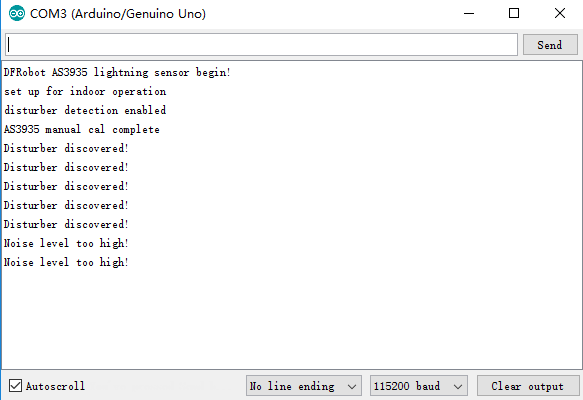 Open the serial monitor of the Arduino IDE and set the baud rate to 115200. It can be set as indoor or outdoor mode. //  Connect the IRQ and GND pin to the oscilloscope. //  uncomment the following sentences to fine tune the antenna for better performance. // It does nothing until an interrupt is detected on the IRQ pin. 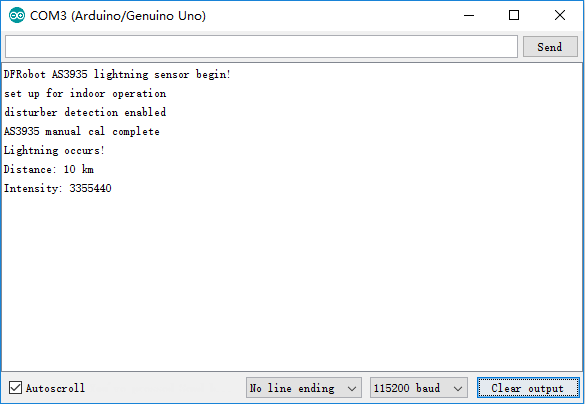 When lightning occurs, the interrupt alarm pin IRQ triggers the controller to display the lightning alarm "Lightning occurs! ", and shows the estimated lightning distance and intensity. 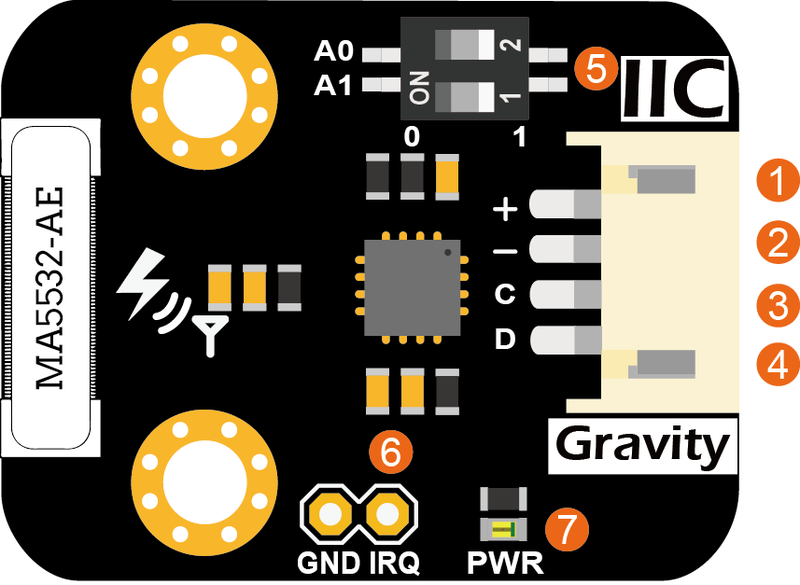 When there is electromagnetic interference near the module, the module will issue an alarm “Disturber discovered!”. If the interference noise is too large, the module will issue the alarm “Noise level too high!” . 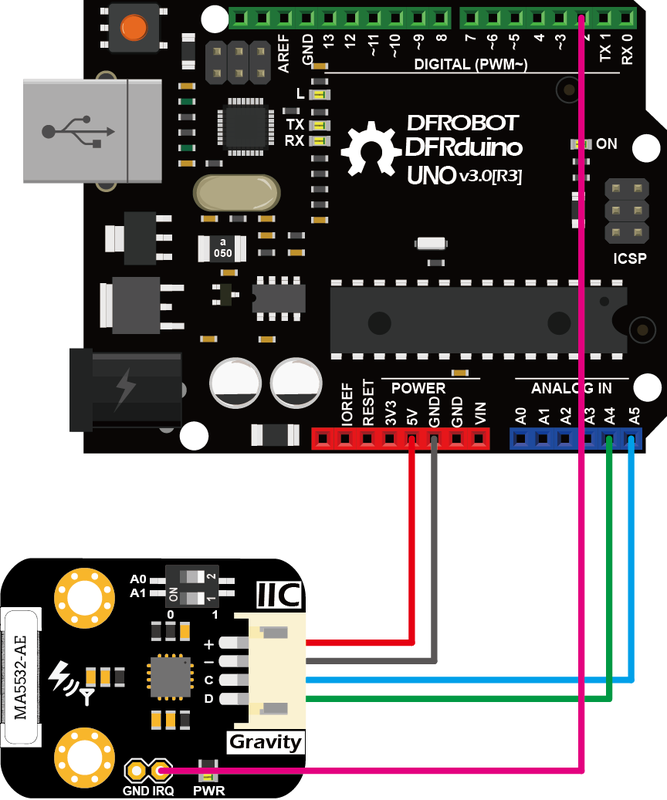 Download and install the DFRobot_AS3935 RaspberryPi library. 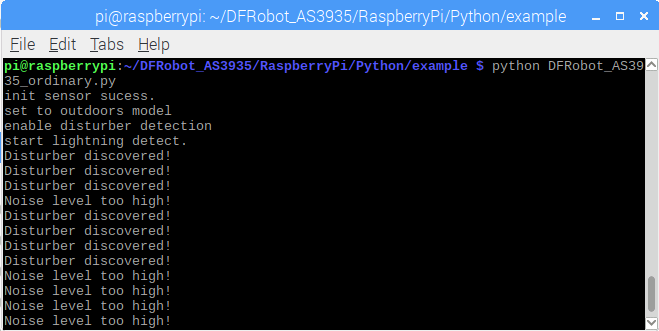 Install DFRobot_AS3935 Raspberry Pi library. 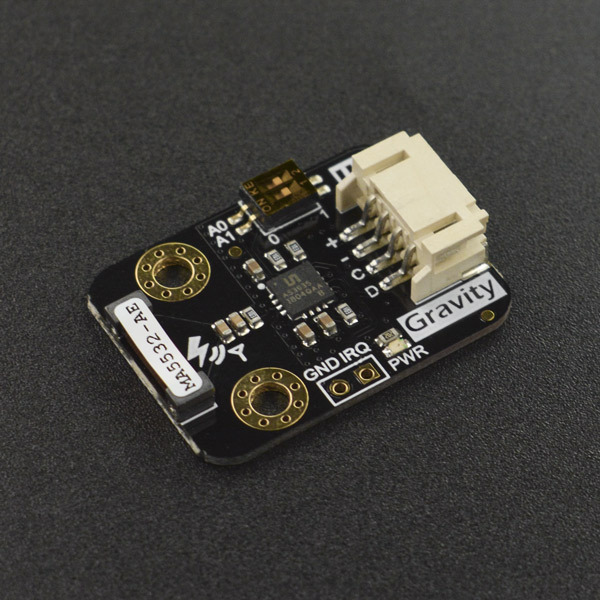 Get SEN0290 Gravity: Lightning Sensor from DFRobot Store or DFRobot Distributor.